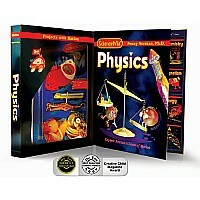 Blast off with Newton's laws of motion and prepare to excel in PHYSICS! 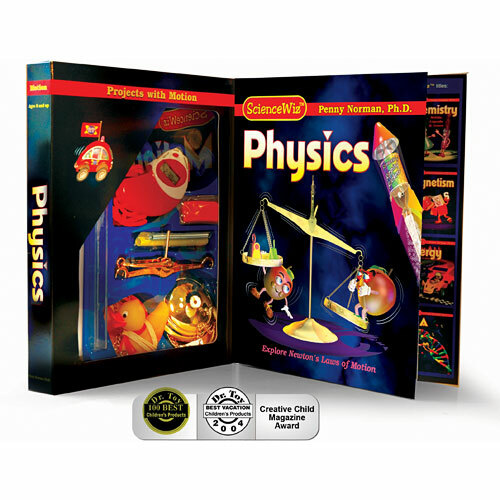 Develop a fundamental understanding of inertia, the laws of motion, centripetal force, mass, weight, velocity and acceleration. Concepts are covered with time tested experiments and highly visual illustrations. This kit includes a balance scale for measuring mass, a stopwatch accurate to 1/100 of a second to clock speed and a jet car that really zooms. 24 Activities. Launch bottle rockets. Perform tricks with inertia. Stay in motion with a floating hover puck. Zoom a jet car. Build your own spring meter. Spin water upside down. Assemble and use a balance scale. Clock a race and accelerate, accelerate. Measure mass Item Requires household items A Rave Review from Lawrence Hall of Science (Berkeley, CA) "Imagine that you are stretched out on your couch relaxing at home. You have kicked off your shoes and socks and are busy doing almost nothing at all. Imagine that your mother asks you to pick up your dirty socks and your shoes and take them into your bedroom. You stay still, as if she has not uttered a word. The idea of moving a muscle seems very difficult. You are suffering from a royal case of INERTIA! Penny Norman, Ph.D. again strikes gold with an engaging science kit based on the properties of motion and gravity. Motion covers many key concepts, including Newton's Laws of Motion and many others. These concepts and accompanying projects are presented in a truly winsome manner, geared specifically to children aged 8. Colorful illustrations seal the deal for a top-notch combination of learning and fun." Warning: Choking Hazard-small part and balloons. Not for children under 3 years. Children under 8 yrs. can choke or suffocate on uninflated or broken balloons. Adult supervision required. Discard broken balloons at once. Keep uninflated balloons away from children. Balloons may contain latex, which is known to cause allergic reactions in some people. Use with caution. This kit makes use of baking soda and projectiles which may be harmful if misused. Read cautions on individual containers carefully. Read and follow all instruction and precautions. Keep them available for reference. 24 activities with easy to follow step by step book. Contains a balance scale, jet car, balloons, parts for a spring meter, rubber duck, air puck, non-toxic clay, water rocket stopper and inflation needle, tube and stopper for baking soda botle rocket, string, paper scale for spring meter, paper cut-outs and a 48 page book.